Pruning or Trimming Purple Sand Cherry and growing Sand Cherry from Cuttings. In this video you will see how I cut Purple Sand Cherry in the fall to make sure they grow nice and tight and don’t get thin and spindly. You will also learn how to take all of those clippings and use them to make hardwood cuttings of Purple Sand Cherry. You can do the same thing with a lot of other woody plants like Forsythia, Weigela, Red and Yellow Twig Dogwood and Rose of Sharon. You can also root grape cuttings like this as well, but grape cuttings only a few buds in a 12″ section of the cane so you have to make your cuttings about 12″ to 14″ long in most cases. Instructions for building the Plant Propagation Box are here. Get Paid for Growing Small Plants at Home! It’s easy, it’s fun and you can start small as you want. You’ll be amazed at how eager people will be to buy the plants you grow. We have a purple sand cherry that is overgrown, and see-through and woody in the middle. It’s about peak size. It’s spring in Ohio right now, and it has purple leaf buds starting. I see all of your advice says to cut an overgrown sand cherry back, but when do I do that? Is it too late now? It’s kind-of in a place where we have to trim it. I would love to rejuvenate it. Thanks. The ideal time to cut an over grown sandcherry, or any other shrub for that matter, is when it is dormant. Late fall, early spring. Right now I’d say you can prune it some, but probably not as hard as it needs. Prune some now, then heavy at Thanksgiving. I save all your emails, not sure, but you mention sandcherry. Tree pruning definitely helps plants to grow well but it is essential that you do using right tools. Also, you should know how to do it or else you will end up with nothing. I am sure your guidance will help people to take care of their trees and prun them properly. Hi Mike any chance you can do a picture follow up to the pruned shrub come this spring? Also I’d like to but a couple of those rooted cuttings. Let me know how we can make that happen. Thanks Mike, another great video from a true master of the garden! realy like purple sand cherry thanks. Mike I learned to cut the bottom of the stem you are trying to cutting at an angle and the top of it straight. Then you always know which end to put in the sand/medium. Good to see a master at work. Thanks for the info you share and the encouragement you give. I set out 50 purple leaf barberry plants this spring. Due to severe heat and drought I lost a dozen or so. I just built a cutting box and have put in about a hundred barberry cuttings. Some just using Rootone & some I also scarred the end like you’ve shown on other plants. I’m also using potting soil, no coarse sand nearby. Wonder what my results will be??? What % will root? Have you ever used Willow Tree Tea to dip your cuttings in? I haven’t, but some of my Master Gardener friends have and think it is excellent. Hope your weight loss is from a diet and that you aren’t ill, but you do look great! Keep up the good work. Thanks, Mike,I enjoy your videos and learn allot from them. I am going out to prune my sand cherry right now .I never knew that it should be done before. I have probably seen them but did not know the name. I looked them up and would love to purchase a few small seedlings to grow in my own yard, if they will do well in this zone. I live in Northeast Oklahoma. Frank, I’ll see what I can do. But keep in mind, all of those questions are answered in the book and videos that come with http://freeplants.com/wanted.htm if you’re interested in growing from profit. Found the info I needed on pages 73-75 Thanks Mike…. Good morning Mike, what is your rate of success of your cuttings developing roots both hardwood and soft? You have lost a ton of weight! LOOKING GOOD …and good for you, Guy! Keep up the GREAT WORK! Sure bet it makes all that gardening easier too! Thank you and you are right! This nursery stuff just got easier after dropping some of that weight. Can the same Hardwood Cutting process be used for ‘Dwarf Burning Bush, Cottneaster and Black Sambucus’ shrubs ? Also..hinge a 2×2 in the center..that way it will hold the cover up when you lift it ! Jerry, this system can be used for a variety of different plants. 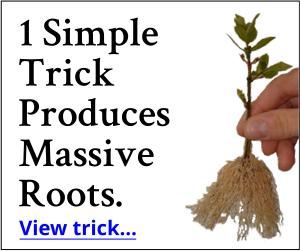 Some don’t root as well in the fall and winter, but you can use this system almost year round. The only time that you really don’t want to be taking and sticking cuttings is in the spring when plants are actively growing. Here in zone 5, northern Ohio we start taking softwood cuttings around June 1st and keep making cuttings right up until the end of January or even February. Then we stop until June.